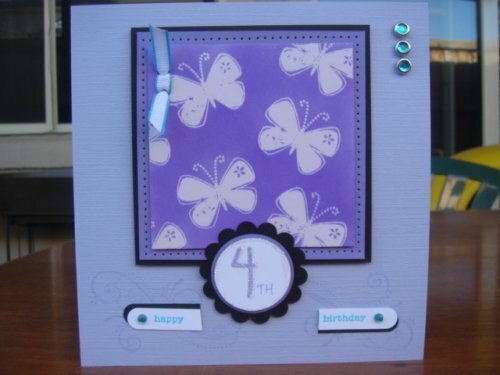 A beautiful little girl we know turns 4 next week and this is the card I’ve made for her. I hope she likes it! 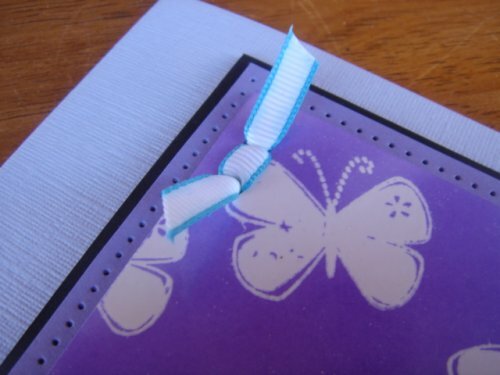 I’ve used the emboss resist technique for the butterflies from Priceless. If you are on my monthly newsletter list then you will receive a tutorial on how to do emboss resist. One of the many advantages of joining my monthly newsletter! 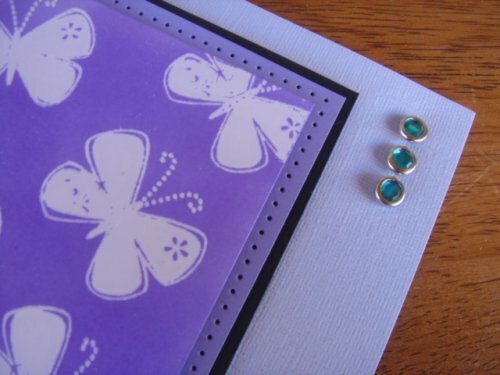 I’ve used the colours Almost Amethyst, Lovely Lilac, Tempting Turquoise and Basic Black. 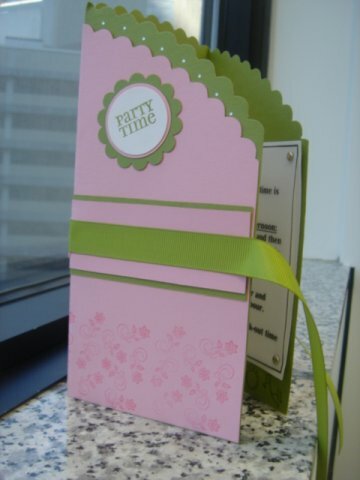 I love the textured card stock – it looks great! I used Best Friends numbers for the number 4 and then my Lovely Lilac marker pen to write the “th”. 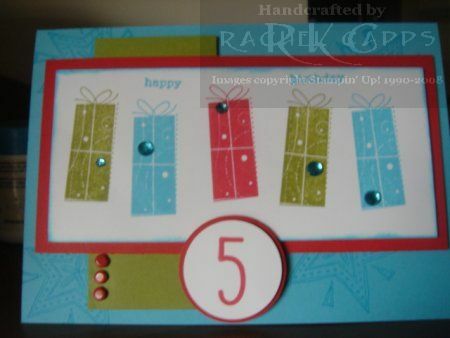 I also love the Stampin’ Up! Rhinestone brads … these look amazing! And I tried a new way to use my marker pens! I used my Tempting Turquoise marker pen to colour the edge of my grosgrain ribbon. What do you think? 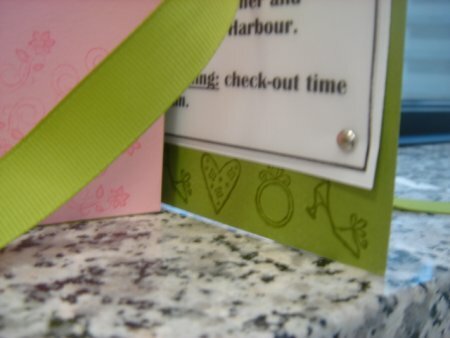 Yet another great use for Stampin’ Up! marker pens! This is the card we made at a workshop on Friday night. There were lots of punches to use for everyone, and everyone did their own take on it … they looked great! I should have taken photos (I’ll try and remember to do that next time). 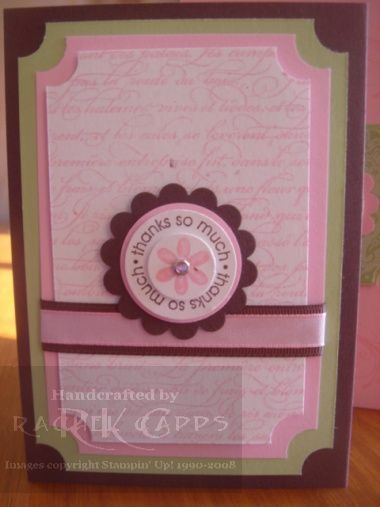 This is the card that inspired me at Stamping Moments. Jenny makes incredible cards in the UK. I had to simplify the card for a workshop though, or we would have been making until after midnight as there were lots of people there! A great time to grab a bargain! Do you like a bargain? I know I do! 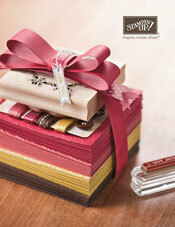 Well, at the moment, the best bargain I know is the Starter Kit from Stampin’ Up!. It is the bargain of the month. Actually, it’s a bargain until 15 August 2008 (in Australia). Why is it a bargain? 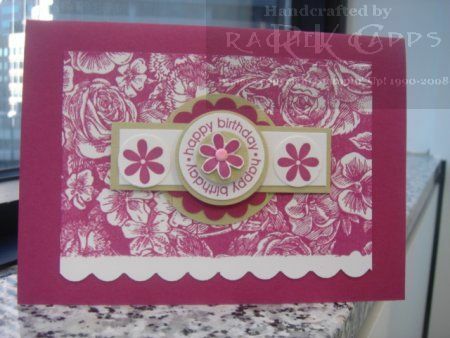 Because Stampin’ Up! have a promotion this month with $25 off the Starter Kit. That means you receive over $560 worth of high quality, stamping product and business supplies for only $299.00!! And if the thought of “joining” niggles your senses please let me assure you, there are NO CATCHES!! If you simply love the idea of grabbing a bargain – then you can grab this bargain and walk away if you want to! The Starter Kit is yours to keep. 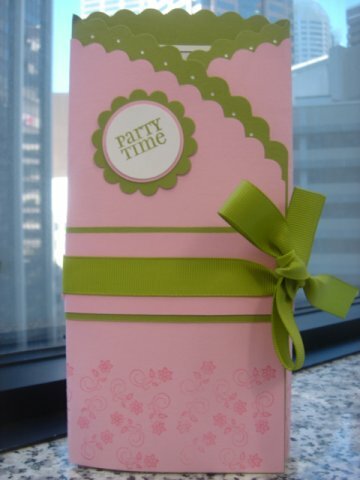 You do not have to give a bit of the Starter Kit back to Stampin’ Up!, nor do you pay any penalties for walking away. Stampin’ Up! do not have any catches on joining up and purchasing its Starter Kit – that is one of the reasons I think it is such a great company! Check out the details on the Starter Kit here. 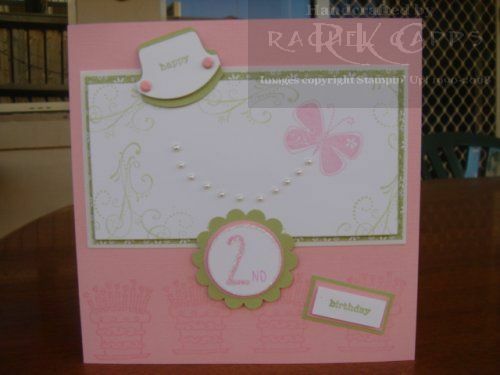 If you like making your own handmade cards, then the benefits of joining Stampin’ Up! are enormous and the list of exciting opportunities truly thrilling! I joined simply to gain the benefit of the discount as a hobby demonstrator and I haven’t looked back. So, if you’ve ever considered purchasing the Starter Kit and joining Stampin’ Up!, now is the time to revisit that idea and make a decision that could really truly excite you!